Grab a drink and start to knit. 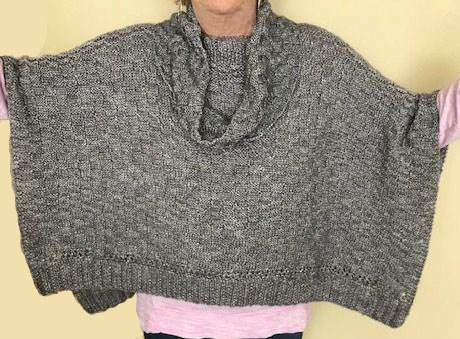 An over sized poncho with an optional detached cowl. A great layering piece and great travel accessory since it folds flat and would be wonderful on a plane or tucked into a bag if you might need another layer. Just enough pattern to hold your interest but simple enough to remember and knit on the go. The Cowl Collar is knit separately to give you choices to wear separately or together. The fabric although held double is very lightweight and the beautiful sheen of the Air Lux yarn makes this special poncho perfect to pair with your jeans or if you are out for the evening. The yardage given makes both the poncho and the cowl.